Mr. Gaiman draws us into our past, our fears and hopes, our homely comforts and all too frequent pain of relationship and how our childhood impacts our lives. He draws in with his simple language hiding some interesting constructs. He draws us in with images of our own past and our own reflections on it. For those that listen to the audio book, he draws us in with his voice and pacing. He draws us home only to realize that home is on the other side of the looking glass, down the rabbit hole and more warped than we like to remember. This book is about remembered childhood, relationships and fantastical elements slipped into our lives, real or imagined by the characters. There are sacrificial goddess-friends, manipulative other-worldly creatures and a child in the land of giants, aka adults. As an adult, the protagonist revisits his childhood and in revisiting awakes to the experiences of it as perceived when he was 7. For us, it’s a journey into our own memories, challenges and current relationships. While good and bad is writ on a large scale of abusive near-drowning, manipulated by flapping creatures and protected by one who loses herself, we’ve had our own times when we were ignored because we were children; we were hurt by those we love and we felt all was against us. While much of his readership grew up in different cultures, Mr. Gaiman taps into a universal experience of remembrance, painful loneliness and challenging relationships even while he does so in the context of fantastical elements. This isn’t done by being vague so we can substitute our own pasts, but using his very specificity, creating bridges to our own past. There is a place for us in this story as there is a place for the protagonist in this world. He does not paint our deepest experiences of childhood a rose tint nor does he paint it into an overwhelming nightmare even as it takes on a nightmarish cast. For a relatively short book, it has multiple levels where there are times you think the characters are mere reference and metaphor and times when they hit home to your own remembered real pain. I love that he allows the Hempstock women to come across very down to earth (with rare exceptions) even while they have the ability to handle difficult creatures of other worlds. They remind me a bit of Tom Bombadil in Lord of the Rings; powerful but tied to the earth. Using the power only as a tool, never as a way to impress or control. Tying this all together is the cosmic duck pond which is as large as it needs to be. While diving into the ocean-pond brings all sorts of knowledge and healing, we mere mortals cannot remain ourselves if we were embedded in it. We must come out. It seems to me that among the many references and meanings tucked into the ocean is that of love. It is in the knowledge of unconditional love that we heal and are protected. Whether it is the warped love of family, the sacrificial love of goddess friends or the wrong headed love of friends whom you’ve harmed, the most painful experience comes from a perceived lack of love from family and even the lack of love of self. I leave it to you to unravel the various levels of the novel. It is a delightful journey of words. One that will reawaken memories and rethinking current relationships. Once again, the fantastical helps us deal with the mundane. 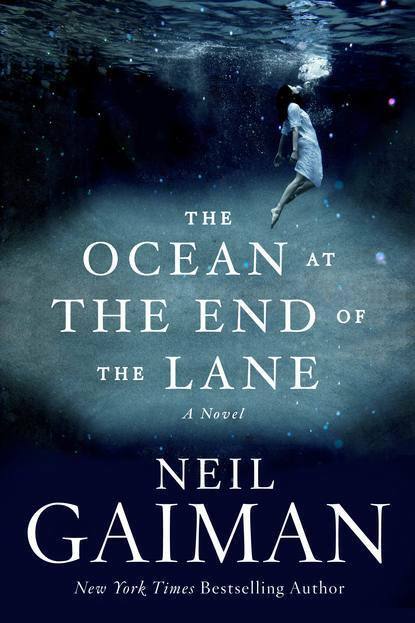 Mr. Gaiman is at the top of his game with this novel.